You have to give a gift? This keyring has a very nice design of the bull's head in multicolored glaze.A keyring is always an useful and decorative accessory.Measurements: 10cm. 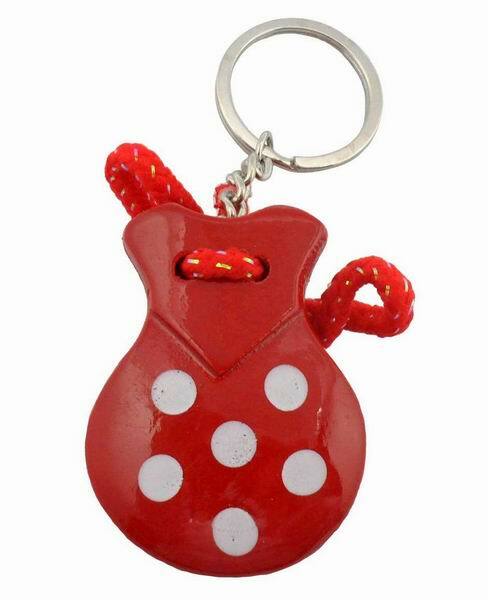 One of the most typical souvenirs are the red castanets with white dots. If we add a key ring to this, it makes the perfect present. This key ring will be very popular if you want to make a party or an event and have a detail with your guests. Measure of the castanet: 5cm x 4cm Length of key ring + castanet: 10cm. A man´s key chain says a lot about him. This model of stirrup with white leather and the Spanish flag is very elegant. Measurements: 10 cm aproximately. Using reusable bags is important for the environment. That’s why we offer you this bag with Spanish appearance for you to go shopping or the beach. The pattern consists of all the typical Spanish stuff like bulls, paellas, guitars, bottles of wine, combs and the typical Spanish flamenca doll. Measurements: 35cm X 40cm. If you like football, you are a Real Madrid supporter and you need a USB flash, this Pen Drive is perfect for you. Product made of rubber. The Pen Drive is a data storage device used to save documents, music, pictures or video. Storage Capacity: 8Gb. Dimensions: 7,5 cm. Warning: to open this pen drive pull gently on the cap. This product cannot be returned. If you like football, you are a Barcelona supporter and you need a USB flash, this Pen Drive is perfect for you. Product made of rubber. The Pen Drive is a data storage device used to save documents, music, pictures or video. Storage Capacity: 8Gb. Dimensions: 7,5 cm. Warning: to open this pen drive, pull gently on the cap. This product cannot be returned.